Proprietary controls allow for high speed, up to 600 strokes per minute operation with outstanding angular accuracy of +- 0.001” at 36'' diameter. 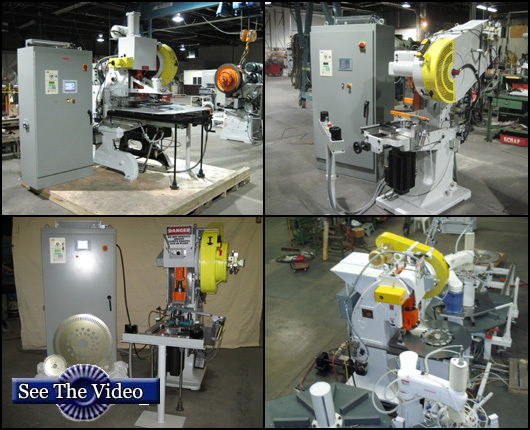 Servotec USA Servo notchers can be used to notch motor laminations, saw blades, and other round blanks. As these direct drive servos use no gears or chains for power transmission, there is virtually no backlash in the system and the achieved notch-to-notch accuracy far exceeds that of the traditional index gear drive. Different notch patterns are programmed in the PC control with touch screen interface. Up to 100 jobs can be programmed and saved by job number. The operator can complete job changes within minutes by selecting a job number and moving the spindle to the location shown on the screen for the selected job. The modular spindle can be quickly changed by removing three screws and attaching the appropriate pilot.